Mayor Walt Maddox now saying Tuscaloosa death toll is at 36 with 400+ injured. Staggering. Such a sad day, just unbelieveable!! Glad to see so many of the TW community are safe but my prayers are going out to all of you, your family and friends that were in the direct path of this monster! FEMA says 131 confirmed dead in Alabama and will continue to rise. Unconfirmed 149 dead in Alabama now. Yes my prayers go out as well to those who were affected. I just got an email which said my co-worker who I work elbow to elbow with at times lost her house and everything in it in (edit) Pratt City area. Fortunately she and her 7 year old daughter are SAFE praise God! So many stories coming similar to this however and worse. Tragic indeed. Edited by Blizzard1, 28 April 2011 - 11:13 AM. This is just preliminary as they have to investigate most of the tornado claims. I know I had a fellow chaser friend who filmed a tornado near DeKalb. Edited by ZackH, 28 April 2011 - 09:16 AM. When it's an F4 or F5 not much you can do to save your life unless you can get underground otherwise you would be killed unless you had time to get in a vehicle and go away at a right angle. I'll just throw this out there. I'm not sure there is much more that can be done as a strong EF4/EF5 crosses two major population centers. Unless you have an underground basement, your chances of survival are marginal. Strong, site build structures are just gone in many areas. Let's put it this way. If the system takes a 6-7 mile jog to the south, I probably wouldn't be here posting. Edited by bingcrosbyb, 28 April 2011 - 09:24 AM. Agreed, with so many possible EF4s yesterday and maybe even one or two EF5s, you're not going to have much luck unless you are completely underground. 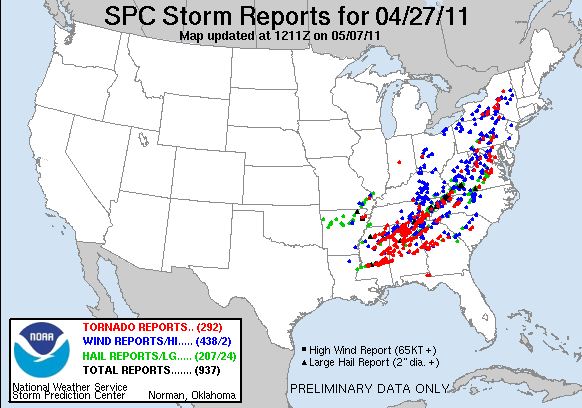 A lot of people don't seem to realize that this event is also unique because multiple strong tornadoes hit multiple large cities in one day. Parts of Tuscaloosa, Birmingham, Huntsville, Chattanooga, and even parts of metro Atlanta were just flattened by strong tornadoes yesterday. I bet the infrastructure issues from earlier in the morning did have some effect, but you're going to have a huge death toll when tornadoes of that strength hit multiple high population areas. Edited by ZackH, 28 April 2011 - 09:25 AM. Could anyone provide information for the Crane Hill area of Cullman. Specifically in the area off of 222 at 141 County Road 345. My Mother-In-Law lives in that area and we have not heard from her since yesterday afternoon. She lives directly on the lake. I know communications in this area are bad but any info you could provide would be great. Thanks.